Congratulations on taking the first steps to a new career. Your request for information has been received and we will be in touch with answers shortly. Federal financial aid is awarded yearly. How much you can receive each year is based on your income and cost of living+ school. Most programs at Bene's are timed so you may earn federal financial aid in two award years. Our financial aid department works with each student to determine their eligibility and how much assistance they can be awarded. Here is a quick tool that walks through the types of questions asked on the FASFA and provides an ESTIMATE of what you would have awarded in a previous financial year. Remember this is for only one year, and each student needs to complete the steps listed below to actually be awarded Financial Aid. How do I apply for Financial Aid? How do I pay for School? 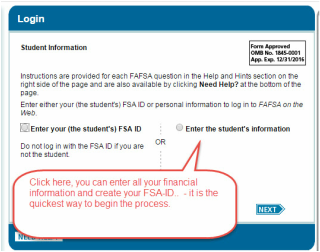 In order to see what you can qualify for you need to complete the Free Application for Federal Student Aid (FASFA). This will help to determine how much financial aid may be able to receive. This create your FSA ID. Bene's is very proud of our efforts to assist our students begin to reach their career goals. Students create electronic portfolios, resumes, and beauty industry professional social media profiles. Our Salon Outreach program is building a network of local salons and barbershops, tying local employers to our student body for interaction and job opportunities. Our job opportunities page on the Bene's Facebook page include job opportunities. ​​Click here to see the Bene's Career Board. Plus Bene's has been teaching beauty and massage professionals for over 25 years. Our graduates are amount the elite beauty professionals in the region. Our alumni network reads like a list of Who's Who in the beauty industry. Our staff and professional development staff can and often do access this group to help introduce our students to the job of their dreams. Your next step is to schedule a meeting with one of our admissions reps at the campus closest to you. We have three locations - New Port Richey, Spring Hill, & Brooksville.